As a marketer, the United States is a pretty grand ol’ place to be. This is where Google was born and bred, and we have freedom with the data we can access and use to better target potential customers. As exciting and cosmopolitan as that all sounds, there are some serious issues that come along with your passport stamps: data privacy laws. Data privacy laws have been the biggest topic of discussion in the United Kingdom and European Union in recent years. 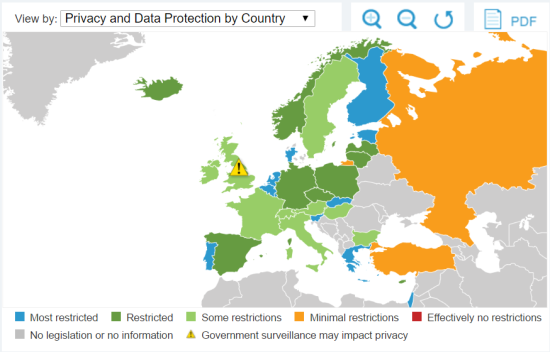 These Global Heat Maps from Forrester show the level of data privacy and protection by country– Europe encompasses the majority of nations at the “Restricted” or “Most Restricted” level. 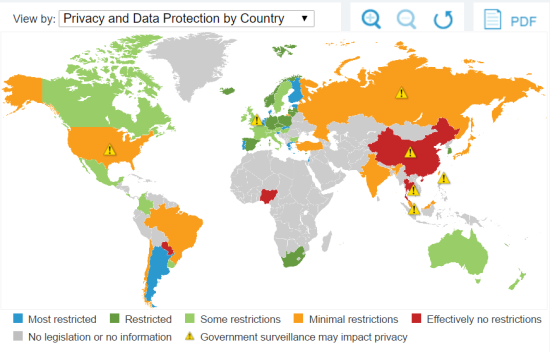 Despite our relative data freedom in the US, these restrictions are worth discussing here, too, for the aforementioned reasons. If you find yourself in those situations (or are currently), here’s what you need to know. In January 2012, the EU proposed a major overhaul of the current policy on internet privacy, seeking to protect users and their personal data. Many of these regulations have recently been approved and will be put into place starting this year. UK policy is based directly on these new EU laws as well. Marketing is not considered an interest that overrides data protection. For some additional, light reading you can consult the official handbook here. But that’s enough to get us started. Maybe you’re smiling and nodding saying, “Sure. That seems pretty straightforward.” But in your head, you’re most likely thinking: I’m a marketer, not a lawyer. What do I do with all of this? How do I bring my amazing ads to people in the EU and not break the law? HOW?! Digital marketing activities are expected to follow the internet privacy regulations regarding personal data protection. Digital marketing campaigns should have a purpose and be transparent. Most of this is related to what they call Online Behavioral Advertising (OBA) across the pond. OBA refers to collecting data about browsing habits, search queries, etc. (i.e. all that Google Analytics goodness) to target customers and perform activities like remarketing. In the EU and UK, advertisers are required to provide “enhanced notice” by the advertiser of such data collection. This icon, when clicked, directs users to the AdChoices website where they can learn how data about their interests is collected and used to deliver relevant ads. It also gives customers control of how they are targeted. Consumers can opt out of being targeted for a certain interests or by a specific company. Opting out of these things does not mean customers will be ad-free– it just means they won’t be targeted in that specific way. If you want more information, the European Advertising Standards Alliance (of which the United Kingdom is a member) has published a full guide of best practices for digital communications, as well as guidelines for OBA specifically. Thrilling stuff. Technically unrelated to Cookie Monster, but similar in that it sounds worse than it really is. 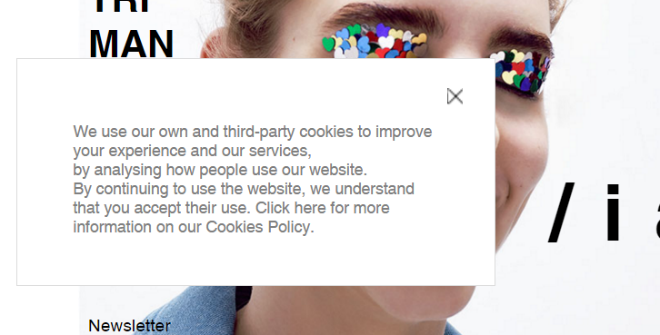 The cookie law once required explicit consent from users before cookies could be placed on their browsers, which rendered tools like Google Analytics practically useless. In Germany specifically, Google has offered a Chrome extension to internet users that disables the collection of any data for Google Analytics. Some of these data protection options were added as an amendment to Google Apps and extended to the rest of Europe, such as model contract clauses. The differences in AdWords has less to do with data privacy laws, but there are often more restrictions than in the US that you should be mindful of when targeting internationally. Currently, AdWords users in the EU operate under Google’s trademark policy. Using trademarks in ad text is subject to a number of restrictions. The United Kingdom and Ireland do have the “Approved (limited)” trademark approval status, for using trademarks in ad text– the same policy that applies to the US. A limited investigation is being conducted in EU/EFTA regions to determine whether using trademarks as selected keywords is confusing for users, but no restrictions exist at the moment. …and beware of international broad matching. There is a lot you can do optimize your international web presence, from website architecture (subdomain, subfolder, or country code top-level domains) to international keyword research (“pants” does not mean quite the same thing in the UK as it does here). Thanks to the internet, the world has gotten smaller, but not more similar– differences in culture, government regulations, and languages continually seem to complicate things. Hopefully, these guidelines will untangle things for those pursuing EU and UK markets. Some regulations are in flux and international efforts require our vigilance, but there’s an ocean of opportunity in global digital marketing, and it’s one definitely worth sailing.